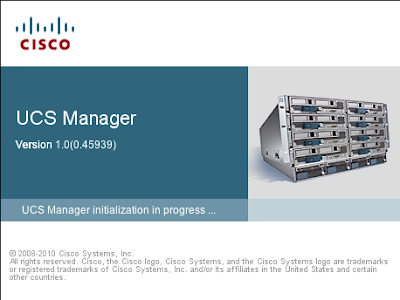 Cisco have released an emulator for the Unified Computing System (UCS). 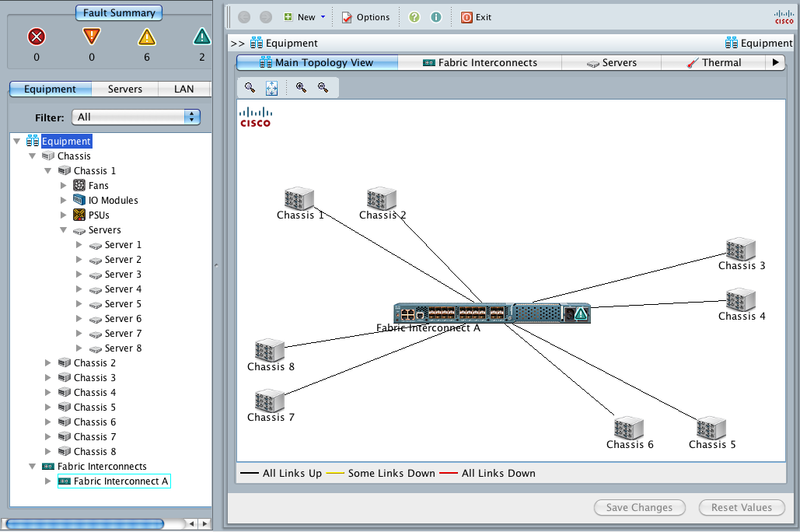 If you are working with UCS you can now run UCSM from your desktop without needing hardware, making training, testing and documentation much easier. To get started go to the download page at http://developer.cisco.com/web/unifiedcomputing/start and complete the registration form [update : the form validation is very painful, just keep trying, ensure you fill out all fields and maybe put in a valid phone number format]. You can then download the virtual machine which runs the emulated environment. The download is 2.16Gb. Open up the VMX file in your favourite VMware software (I use Fusion on my MacBook) and it will boot giving itself an IP address. It only uses a single vCPU, 1G of RAM and close to 6GB of disk. 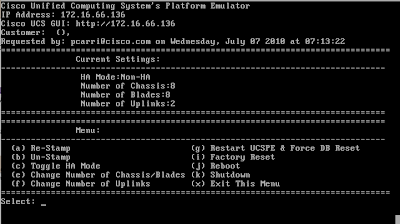 Most of your activity will be via the GUI but you can change what your emulated UCS environment looks like via the console of the machine. Login with the username "config" and password "config" and you are presented with a simple menu. Its handy being able to set the number of chassis and blades. You don't have a lot of flexibility, for example all chassis have the same number of blades and you can't have 4 uplinks, only 1 or 2. Once you have configured up your environment point your web browser to the allocated IP address. Click the "launch" button to load the Java management GUI. Once you log in you have the standard interface and can interact with many of the elements. Of course as its an emulated platform so some things don't work such as the no data path, no SNMP, no KVM, no Telnet/SSH, no CLI, no RBAC and limited HA functions. Also the the VMware tools in the machine is out of date. Sounds like a lot but its still quite functional. If you or others in your company need to work with UCSM I recommend you check the emulator out. Wow this looks really cool, I'll definitely have to check it out. I'm glad I can get it to work on my mac as well. @Anonymous, its very frustrating. Ensure you fill in all the fields. Check all the categories for the type of relationship, put in a reason and ensure you check the last tick box about information. Keep trying, most are getting through it eventually! I'm starting to go crazy... entering any data into a form - always in response i receiving an error message. may anybody show in what format entered data will be? Still get an error, even if completely filled out with CCO ID. One time I was even forwarded to http://sso.cisco.com; still no go! Any idea on Product Name? USCPE? The site gave errors in IE switched to Chrome and it worked the first time. Don't know if those matter but that is what I used. The word is out that the Unified Computing Platform Emulator (UCSPE) is available and the number of concurrent downloads went through the roof. Last night additional network bandwidth was added and the average download time is now 20 minutes. Requirements for long-term network bandwidth are under evaluation. It is unknown if the volume will accelerate bringing the network to it's knees or hold at this level. Forward... A new release of UCSPE with several enhancements (including only requiring future diff updates) is expected in the next couple of weeks. 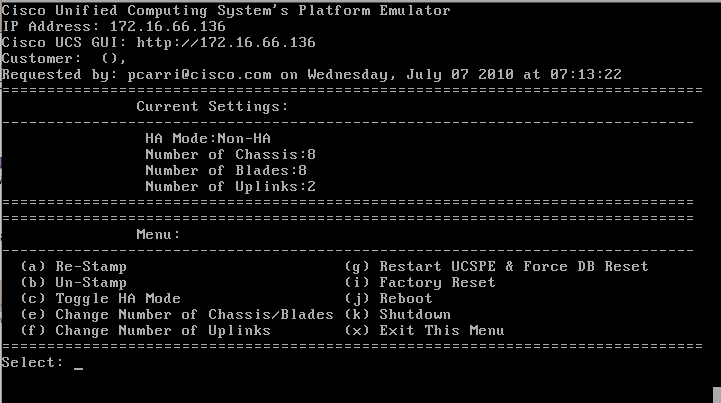 Failed to import appliance /media/VMs/UCSPE/Cisco_UCS_Platform_Emulator_2.1.1aPE2.ovf. Could not create the clone medium '/media/VMs/vm/Cisco_UCS_Platform_Emulator_2.1.1aPE2-disk3.vmdk'. VMDK: could not create new file '/media/VMs/vm/Cisco_UCS_Platform_Emulator_2.1.1aPE2-disk3.vmdk' (VERR_ALREADY_EXISTS). That's the second error, after it bombs out the first time. You're getting the above because the files already exist. You'll need to remove the directory and files it created before attempting again. I'm getting this same problem, but the original error, prior to this one, is "Failed to import applianceCisco_UCS_Platform_Emulator_2.1.1aPE3.ova Medium is already attached to port 1, device 0 of controller 'IDE Controller' of this virtual machine"